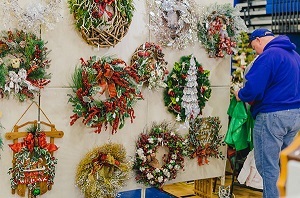 The City of Fairfax Holiday Craft Show is celebrating its 33rd year in 2019. This annual show 2 day indoor show provides an opportunity to purchase one-of-a kind handmade crafts such as baskets, dolls and accessories, floral, jewelry, paintings, pottery/clay, and a multitude of wood items made by local and regional artists. More than 200 juried crafters and gourmet food vendors participate. Attracts 5,000 shoppers annually. The show is held at Fairfax High School in Fairfax, VA.
All work must be original, handcrafted art and craft items produced by the vendor (United States based artists only) and must be representative of items juried. Parks & Recreation reserves the right to request an inventory of items to be sold by vendor and to disallow any entry based on the guidelines and decisions of the Selection Committee. • Kits & commercially manufactured merchandise. • Novelty sale items including balloons & inflatable toys. No canopies, tables or chairs will be provided. Vendors must provide tie-downs, weights (such sand bags), and any other sturdy equipment necessary to stabilize canopies, displays and artwork. Electricity available for Holiday Show (designated areas). Vendors who participated in the shows the previous year can request the same space location for the upcoming year. We will try to accommodate, but cannot guarantee assignment of the same space. 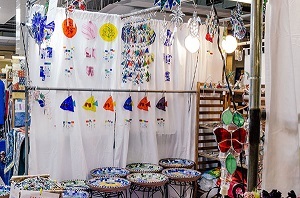 Photographs taken by staff of a vendor's display may be used in future programs or advertisements. Vendors are required to conduct all activities within their contracted space. Vendors may not switch, sublet or apportion spaces to other vendors or be affiliates of companies. Vendors must keep booths open during ENTIRE festival/show. Vendors are prohibited from using amplifying devices. Vendors may not use generators. in City of Fairfax craft shows. If you are a city resident and your business is located in the City of Fairfax, you must have a current business license. Contact the Commissioner of Revenue’s office at 703-385-7880. All vendors that sell jewelry must select as their category listing “Jewelry” even if they also sell other items. The Multi-Media category is for those vendors whose products are a combination of categories (two or more) excluding the category Jewelry. Craft Show hours are Saturday from 10am-5pm and Sunday from 10am -3pm. Set-up is scheduled to take place the morning of the events. Crafters will be able to set up starting on Saturday from 6-9:30am and Sunday from 8-9:30am. Detailed times will be provided upon notification of acceptance. For the Holiday Craft Show, dollies are highly encouraged to transport items from vehicles to inside the school. Each exhibitor is responsible for his/her own booth set-up and take-down. Staff is not authorized to assist with set-up or take-down. Canopies, tables or chairs will not be provided. It is strongly recommended that vendors carry their own insurance policy to cover their actions. The City is not responsible for loss or damage to exhibitors or vendors. 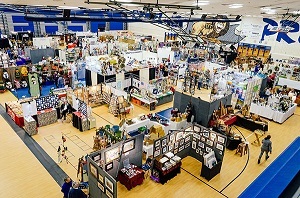 NOTE: By applying to exhibit at the Holiday Craft Show, all exhibitors and their personnel waive any claim against, and agree to hold harmless the City of Fairfax and the Parks & Recreation Department, and their employees and volunteers, from any and all liability for damages or injury incurred during participation in the Holiday Craft Show. Vendors must comply with State of Virginia tax laws (804) 367-8037 or website at www.tax.virginia.gov/laws-rules-decisions, Fairfax County Health Department 703-246-2444 or website http://www.fairfaxcounty.gov/hd/food/ and City of Fairfax Fire Marshal requirements 703-385-7830. In the event of a cancellation by a vendor prior to August 11, 2019, a full refund of the participant fee paid will be made to vendor. After August 10, the Parks & Recreation Department will retain all fees paid. Holiday Craft Show - per space - Paid directly to City of Fairfax not through Juried Arts.